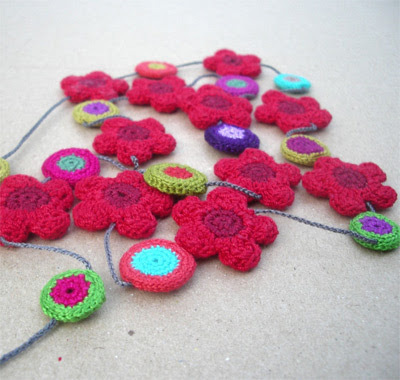 If you've ever tried to crochet, you will know that it is no mean feat. 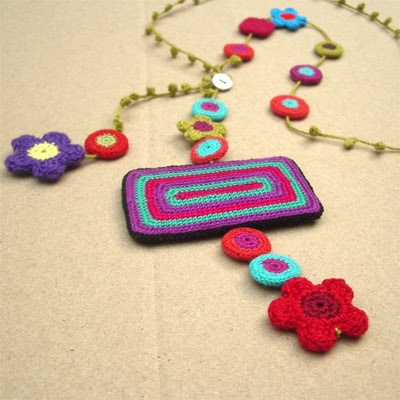 So I was blown away to find the incredibly intricate micro-crocheted, knitted and felted fashion accessories of Gitte. Melbourne-based sisters Brigitte and Janine hand-craft these gorgeous pieces of wearable art with a folksy feel. In the Gitte store you'll find a range of necklaces, scarves, chokers, rings, brooches, cuffs, bracelets and hair slides. The crochet work is astonishing. Brown Owls - the gauntlet has been thrown down! You can find Gitte wearable art in the Gitte Etsy store online. Some Beautiful pieces there, am heading over to their site now to have a better look! WOW. I have tried crocheting and it was a horrible mess that required many cups of soothing tea in order to recover. I wish I could make these... they are so pretty. Oh I love these. I came across Gitte when I was searching Etsy recently and was blown away by their gorgeous work. I can't crochet, but I'm completely obsessed with it. I keep finding beautiful things I'd love to make. Note to self: must try harder. Persevere. Or maybe just keep buying other people's creations?! These look great Steph. Goof to meet you at ABCD tonight...had some wonderful exchanges and love all the connections. Hi Melissa and littlechrissy - glad you like them; I think if you've tried crochet you can truly appreciate the talent (and time) involved in these pieces. Lisa - you're so on the ball with all things cool! And I'm with you on the crochet crush. Sophie - so lovely to meet you last night and I'm really glad that you got a chance to meet some likeminded folks.